You probably don’t know this about me, but I LOVE, LOVE, LOVE making Christmas cards! What I don’t love… the hassle of trying to find the right outfits, planning where to take them, finding a competent candidate to follow my instructions while holding my camera, or the bickering that is inevitable when we are in front of the lens. However, the thing I dislike the most is posing us. I can’t see what we are doing or how we are standing and I ALWAYS end up tense and frustrated during the process. Somehow we managed to get through it this year without too much bloodshed and our Christmas cards were delivered in the mail a couple of days ago. And I LOVE them! Mostly, because I dared to use a photo that was an outtake, but also because they seem a little silly to me, which fits my personality. But the best thing about our cards is that I ordered them from Minted. Minted makes the most luscious cards! Oh the paper! I just love feeling the thick matte card stock. The colors are so vibrant and well…they are just so easy to make. This year, you can even have a note and an additional photo printed on the back, which I did. Some people have asked me why I didn’t design and print them myself. The reason is, this year I just didn’t have the time and I am very familiar with Minted’s quality, so I did the next best thing. I wish I could show you the cards, but I haven’t sent them all out yet, so no peeking. 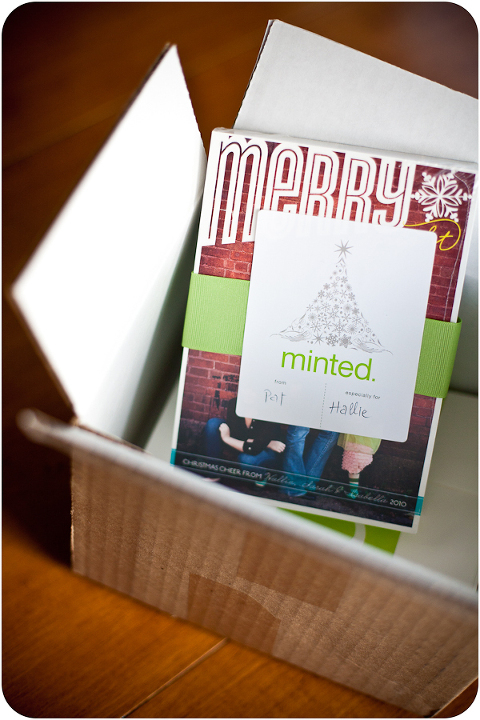 If you haven’t made your Christmas cards yet, take a look at Minted, their designs are gorgeous!